This playground equipment in Rocket Series, the rocket is make by plastic tube which from the floor to the top level! In side the tube have ladder for kids climbing. Inside this rocket have passageway to each floor. 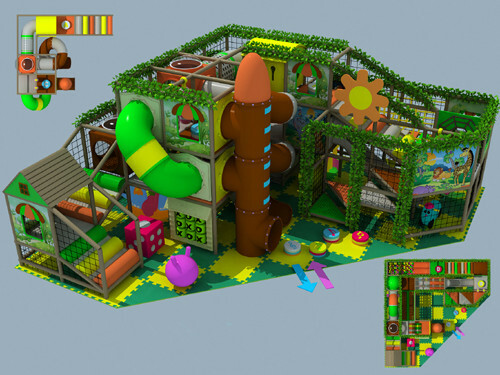 This three level design also including slide, ball pit and other play toys for kids to explore. The weather is getting hotter and hotter, summer vocation is around the corner, have you already decided a proper place for your kids to spend their summer vacation? As for parents, I think they are looking for somewhere not far from their home, comfortable and safe, and at the same time won’t cost you a lot of money, right? What’s more, the place had better not attract all their attention all the time so they can spare some time in study. As far as I’m concerned, indoor playgrounds are the perfect place to solve your problems and concerns, however, the indoor playground shout at least be very safe and has attentive and responsible babysitters, I think jungle gym is a good choice. The advantage of choosing an indoor playground near your home is not only the convenience of picking up your kids, but will also teach your kids a lot of useful skills like swimming and climbing. We all most children today are very poor at sports because they can’t get access to sports for too much homework or limitation from their parents, when they grow older, it turns to be harder for them to do exercises because their life is filled with pressure and expectation of people who want them to be successful someday. as parents, it is cruel for your kids to deprive their life of the chance and freedom to play. Sometimes theses skills can be more important than the knowledge they’ve learned in classes. In addition, parents will get rid of constant worry if their kids are not so far away from home. Most children are not independent enough to take care of themselves and they will be set back by difficulties they met in a summer camp far from their home, which means that they will be frightened by some unexpected situations, this is not only harmful to their growth, but will also add to parents’ concern. But things will be different if small children have learned some sills in the indoor playground nearby their home first. according to the above analysis, the entertainments provided by indoor playgrounds are enough to present them with a joyful summer vocation. In this public and animate place, their characters of outgoing and genial will also be cultivated through making friends and playing games with each other. At the same time, the balance of study and play can be kept well. What’s more important is that their body condition will be largely improved by doing different exercises every day.